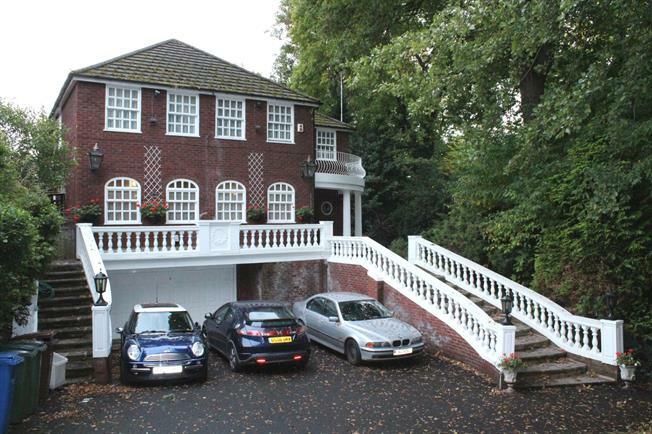 5 Bedroom Detached House For Sale in Stockport for Guide Price £1,100,000. A most impressive and attractive five bedroom detached family residence sitting on a generous plot backing onto Bramhall Park Golf Club. Set behind double gates the property is an extremely substantial offering with accommodation suited to the needs of the growing or established family. Having recently had new kitchen, bathroom and en-suites added the property is presented to a high standard throughout. Accommodation comprises:- large reception hallway with stunning curved staircase to the first floor and galleried landing, downstairs WC, family room, dining room, exceptional primary sitting room and breakfast kitchen to the first floor. The upper level comprises of five generous bedrooms, two of which boast en-suite and dressing room facilities, house bathroom and two balconies, one to the front and one to the rear. Entrance door to the front aspect, two radiators, tiled floor, access into the downstairs WC, cloaks cupboard, family room, kitchen, dining room, living room and feature curved staircase up to the first floor and landing. Porthole window to the front aspect, radiator, pedestal hand wash basin, high level WC and tiled wall and floor. Three sets of French patio doors to the rear aspect looking out and opening onto the rear garden and patio, window to the side aspect, two radiators, feature fireplace with marble surround and mantle piece, tiled floor and open access into the dining room. French patio doors to the rear aspect, window to the side aspect, two radiators and tiled floor. Two windows to the front aspect, radiator and tiled floor. Two windows to the front aspect and one to the side aspect, entrance door to the side aspect, comprehensive range of eye and base level storage units with work surfaces over incorporating, one and a half bowl sink and drainer unit, inset four ring gas hob with cooker hood over, electric oven, integral dishwasher, plumbing point for washing machine, space for tumble dryer, space for fridge/ freezer and radiator. Gallery landing with two radiators and door out onto the balcony. Views to the rear aspect. One window to the rear aspect, one window to the side aspect, two radiators and access into the en-suite and dressing room. Frosted glass window to the side aspect, four piece suite comprising, bath with thermostatic shower over, hand wash basin, low level WC and bidet, radiator and tiled floor and walls. Two windows to the front aspect, one window to the side aspect, two radiators and access in to the en-suite and dressing room. Frosted glass window to the side aspect, four piece suite comprising, bath with thermostatic shower over, hand wash basin, low level WC and bidet, tiled floor and walls. Two windows to the front aspect, radiator and door onto the balcony. Two windows to the front aspect and radiator. Frosted glass window to the side aspect, four piece suite comprising, double ended air bath, hand wash basin, low level WC and bidet, radiator, tiled floor and walls.